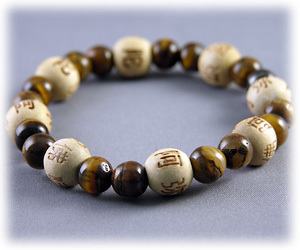 Men and women love this bracelet created from genuine Tiger's Eye and wooden Karma beads. Wear and it can help to be protected from evil, negativity and harm, free from anxiety, nervousness and fear, able to think more clearly, be focused and alert, achieve balance and be grounded in every aspect of your life. Comes with attached card with above text.